This book investigates the minds, motives and methods of con artists—and the people who fall for their cons over and over again. While cheats and swindlers may be a dime a dozen, true conmen—the Bernie Madoffs, the Jim Bakkers, the Lance Armstrongs—are elegant, outsized personalities, artists of persuasion and exploiters of trust. How do they do it? Why are they successful? And what keeps us falling for it, over and over again? 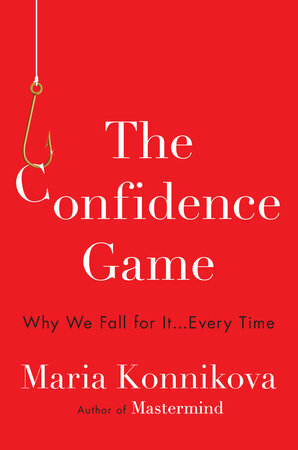 These are the questions that journalist and psychologist Maria Konnikova tackles, examining stories of con artists from a scientific, dramatic and psychological perspective, trying to answer how our sense of truth can be so easily manipulated. Konnikova’s articles have appeared online and in print in the New Yorker, the Atlantic, the New York Times, Slate, the New Republic, the Paris Review, the Wall Street Journal, Salon, the Boston Globe, the Observer, the Scientific American MIND, WIRED, and the Scientific American, among numerous other publications. She blogs regularly for the New Yorker and formerly wrote the “Literally Psyched” column for the Scientific American and the popular psychology blog “Artful Choice” for Big Think.